The spleen is a large encapsulated pulpy mass that consists of vascular and lymphoid tissue. It is situated between the fundus of the stomach and the diaphragm, in the superolateral part of the left upper quadrant (left hypochondrium) of the abdominal cavity, where it is protected by the thoracic cage. The spleen is considered the largest of the lymphatic organs. In an adult individual, the spleen’s main function is to filter the blood by removing old red blood cells. It participates in the body’s immune system as a site for lymphocyte proliferation, immune surveillance, and response. The spleen is an intraperitoneal organ that is covered almost entirely by peritoneum that adheres firmly to its capsule, except from at the splenic hilum, where the branches of the splenic artery and vein enter and leave. It is connected to the stomach and kidney by two ligaments that belong to the greater omentum, a fold of visceral peritoneum that originates from the stomach. The gastrosplenic ligament connects the spleen with the greater curvature of the stomach, while the splenorenal ligament connects the spleen with the left kidney. The splenorenal ligament is comprised of two layers of peritoneum, which the splenic vessels and the tail of the pancreas lie within. The spleen is a mobile organ, whose outer surface can be anatomically divided into a superolateral diaphragmatic surface and an inferomedial visceral surface. The diaphragmatic surface is smooth and convexly shaped to fit the concavity of the left dome of the diaphragm and the curved bodies of the nearby ribs. The close relationship with the ribs serves as a means of protection for the relatively fragile spleen. The visceral surface faces inferomedially towards the abdominal cavity. It is irregular and marked by gastric, renal, pancreatic and colic impressions. It has anterior, superior, posteromedial and inferior borders. The anterior border is sharp and notched. It connects the lateral ends of the superior and inferior borders, and is related to the colic impression. The superior border is convex, and like the anterior border, it is sharp and notched. It separates the diaphragmatic surface from the gastric impression. Both the posteromedial and inferior borders are smooth and rounded. The posteromedial border faces the vertebral column, while the inferior border lies between the diaphragm and the upper portion of the lateral border of the left kidney. The latter separates the renal impression from the diaphragmatic surface. The arterial supply of the spleen is exclusively provided by the splenic artery, which originates from the celiac trunk. The size of the splenic artery indicates the large volumes of blood that pass through the spleen via its capillaries and sinuses. The venous drainage of the spleen flows through the splenic vein, which is formed by five or six tributaries that emerge from the splenic hilum. It combines with the superior mesenteric vein to form the hepatic portal vein. The spleen is innervated by the splenic plexus, which consists of branches of the celiac plexus, the left celiac ganglion and the right vagus nerve. 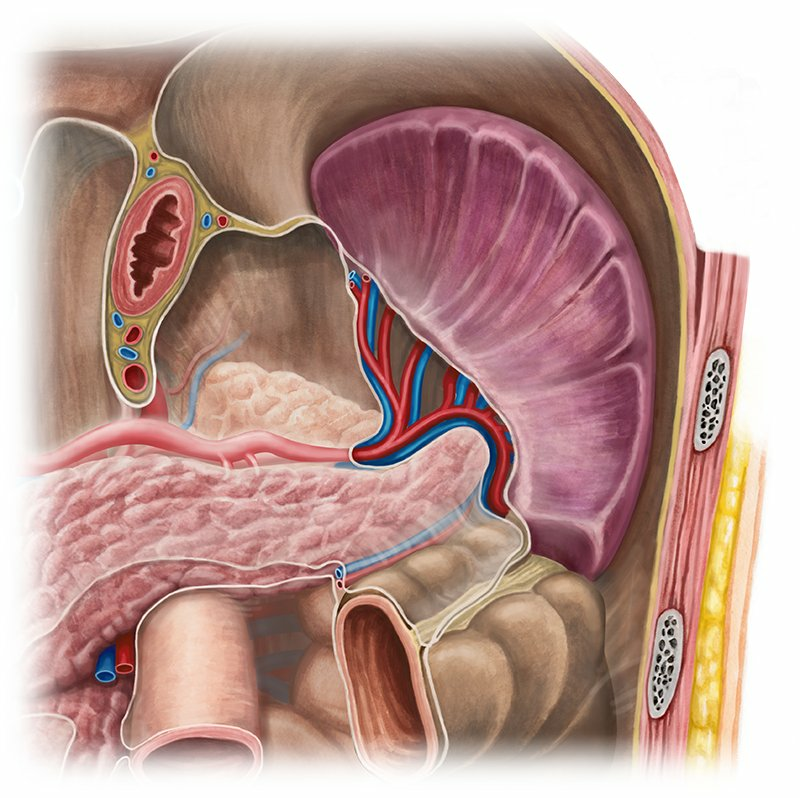 Want to learn more about the Spleen?